Master of Exercise Physiology students Demi Guy and Joshua Morrow. 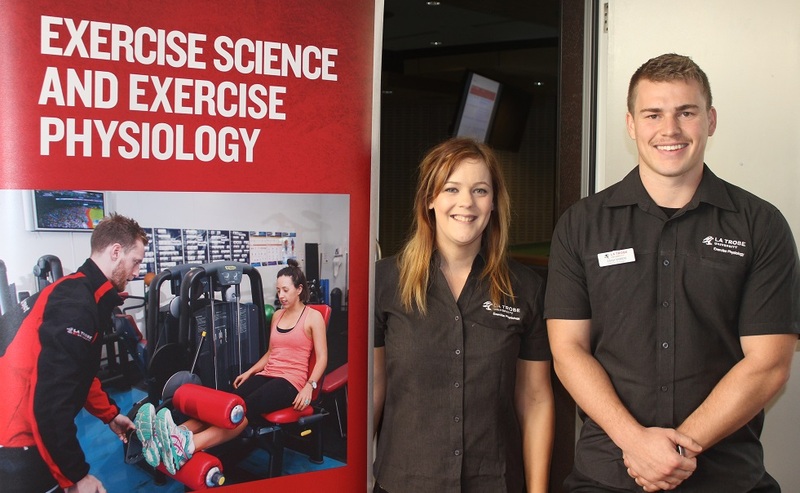 It’s been a full program of research highlights at today’s exercise physiology student conference. Sixteen students took to the McKay Lecture Theatre to share the outcomes of their 2016 projects, many of which will have an influence beyond class assessments. Joshua Morrow and Demi Guy both worked with staff at Costerfield Mine near Heathcote on their investigations into the risk factors behind some industry-related syndromes. Joshua sought to better understand the relationship between Whole Body Vibration and lower back pain. “This research could help develop health guidelines, such as recommendations on what sort of exposure miners should be getting and whether they need to limit their hours with certain machinery,” he said. Demi said her topic, Hand Arm Vibration syndrome, was one of the most common and damaging conditions that can arise from the use of vibrating hand tools at mines. She said symptoms could include pins and needles in hands and arms, loss of sensation and blanching of fingers. Her research concluded an increase in exposure to vibration would increase the likelihood of developing the syndrome. “A lot of research has been done overseas, in Europe and Asia, but the Australian research is really minimal, so this will play a part in growing that,” Demi said. The final-year students now have just ten days of work, and one exam to go, before contemplating how they’ll next apply their qualifications and research skills.